Area 3-8 is the eighth course of Teatime Twirl and the twenty-sixth course overall in Mario vs. Donkey Kong: Mini-Land Mayhem!. 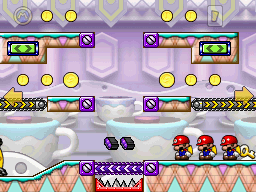 The level features three Mini Marios, including one with a key. The Mini Marios begin on a platform on the lower level on the right, with the exit door at the bottom left. In order to reach it, the Mini Marios must swap positions so that the Mini Mario with the key is in front, then reach the door normally. The M-Token is located on the top right, atop a platform on the upper level. To collect it, the Mini Marios must collect the two Conveyor Pickups, then approach it via sloped Purple Conveyors. The Mini Mario Card is located on the top left, atop a platform on the upper level. The Mini Marios must collect it in the same manner as the M-Token.